What happened to “Unlike most short “facts” you’ll find around on the internet, the quick facts you’ll find in this section have all been thoroughly researched to verify their accuracy”? Weak additions to your fact. @Deviant Kiwi: It is a fact that he invented the modern golf ball. The story that goes with it is the one commonly accepted. However, I’m always skeptical of such anecdotes, hence my disclaimer. 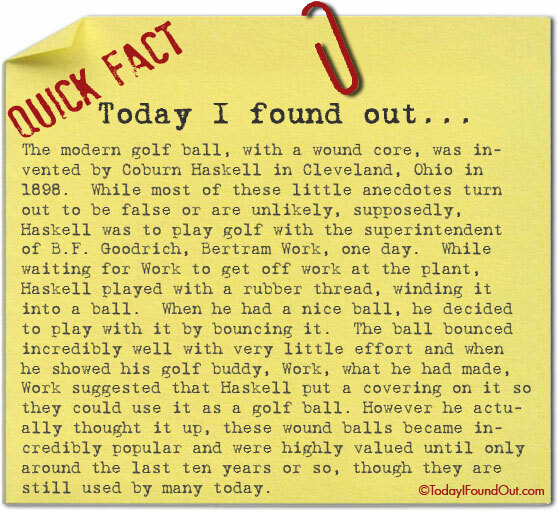 The quick fact though is not how he came up with the idea for the modern golf ball design, but rather who invented it.